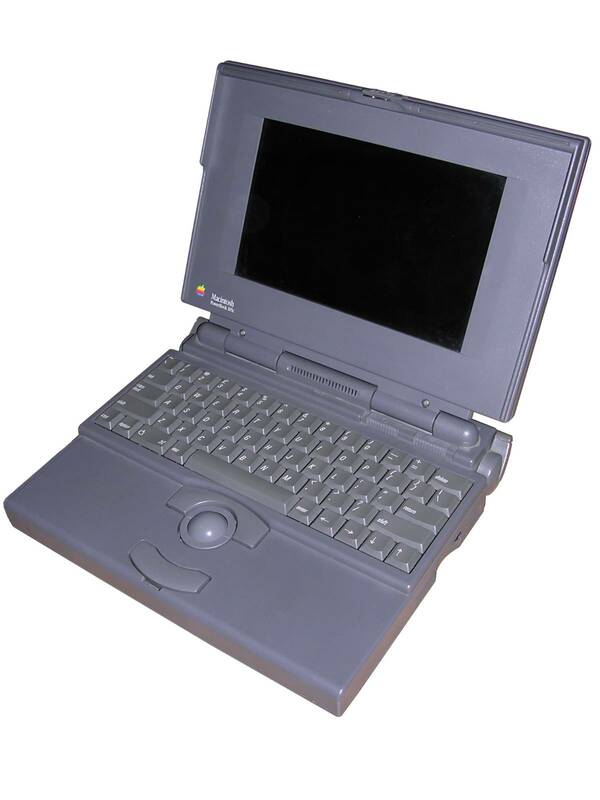 Ths is the first Apple notebook with colour screen. 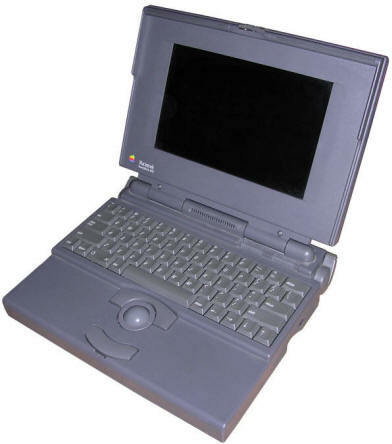 It was introduced in 1993, and discontinued in 1994, although according to many sources (Mactracker, LowEndMac) it was discontinued in december 1993, my unit is from early 1994. It had a Motorola 68030 CPU running at 33MHz and 4MB of built-in RAM, expandable with dedicated modules. The display offered 256 colours ad 640x400, it was also possible to connect external monitor with Mini-15 connector. For storing data, an internal SCSI 120MB hard disk (manufactured by IBM) was used or there was a built-in floppy disk drive. Input devices were also built-in: Quite comfortable keyboard, but with arrow keys located in a single row (like in some Apple II computers) and trackball. At the time of introduction it was quite expensive, but offered a colour screen. The screen had a poor viewing angle, a bit worse than some monochrome and grayscale units, but was colour. I don't know the history of my unit, but it was assembled from two units bought by some company in 1990s - early Powerbooks had leaking battery, which as result destroyed mainboard. Unfortunately there were also two other common problems: First, connections failing in the main inverter (there are two inverters), the second problem was HDD cable failing. My unit had all 3 problems and I fixed only two - it's impossible to fix broken HDD cable without linking the broken parts in polymer ribbon some way (soldering is out of question because it's plastic). P.S. Power supply needs to be exactly in specification - if voltage is a bit smaller or maximum current is 2A (like in power supply units for earlies Powerbooks) it will NOT run. Unlatch rear. Carefully open the rear, disconnect LCD cable. Unlock latches near HDD/battery. Remove top part (keyboard, trackball, palmrest, lid) assembly. All modules are connected with transfer connectors (boards are parallel). Orient the LCD 90 degrees to the lid. Remove two screws on the bottom. FROM NOW DO NOT MOVE THE HINGES. Do not open or close the lid. Unlatch the bezel from the left side ant it'll go. Then you can re-seat connections in the main inverter which is on the right side of LCD. If backlight drops, flickers or resets the computer this is usually the culprit. Remember: When two screws holding front bezel are removed, do not open or close hinges as this configuration adds excessive forces to two other bolts keeping the LCD and its "cover" part in one piece.